You are here: Home / Cruise Reviews / Is Hapag-Lloyd’s Europa The World’s Best Cruise Ship? 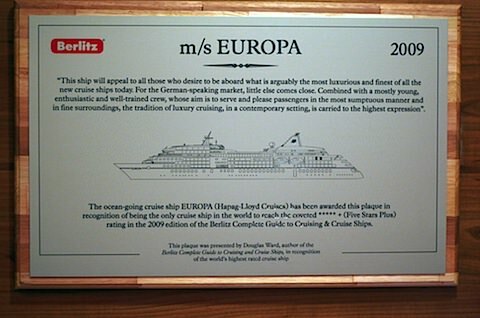 In the atrium of Hapag-Lloyd’s Europa is a star-studded wall lined with plaques such as this one, recognizing the much-celebrated vessel as the world’s highest-rated cruise ship. The Berlitz Complete Guide to Cruising & Cruise Ships thrusts upon Europa Five Stars — Plus. Lest anyone doubt that Europa claims high stakes in the guide books, other plaques nearby recognize the ship as being tops in the game, and one guide even goes so far as to run Six Plus Stars up the flagpole. No doubt that Europa ranks among the world’s best passenger ships. In actuality, of course, it is the software component (e.g., the staff, cuisine and programming) that has reviewers seeing stars — and generously distributing them. But does Europa rank as the best passenger ship for me? Would it for you? For the moment, I withhold judgment. After all, I’ve only been on board for three days. I will say this: Europa delivers an extremely fine – and refined — product. There is much to appreciate here: a well-trained, professional and polite staff, the oh-so-delicious dishes in the attractive specialty restaurants and all of the expected trappings of a luxury vessel, with some exceptions that I’ll address in a future post. Where Europa departs from the luxury vessels I’ve cruised is that it is a German-speaking ship. That may be off-putting to some, but for me, the experience of being, to paraphrase Mark Twain, an “Innocent Aboard” is proving to be thoroughly delightful. I am enjoying the German lifestyle — Wienerschnitzel and potatoes for lunch, home-cooked waffles for mid-afternoon snack, Currywurst and sparking Sekt in the late evening. Unfortunately, I’ll miss the Bavarian brunch, with beer, sausages and pretzels, at the end of the voyage (I disembark early, regrettably). What strikes me most of all is that Europa offers something different for tried-and-true North American cruisers, such as me and a couple of others from North America on board. Not only do we get to cruise the Baltic Sea, but we get to return to a German hotel after each shore excursion. How much better could it get for culture-lovers? There’s even a small piece of Germany implanted on Europa. The Sansibar shares the same name as the popular restaurant/bar on the island of Sylt, an exclusive enclave situated in the North Sea. “You really must try to go there,” Europa Hotel Director Josef Gruber tells me. “But of course, you need to know someone.” On Europa, you simply need to trundle up to deck nine and enjoy the evening with everyone else. Sansibar is popular for sail-aways and late night. Hours are from 5 until “Open End,” as the program of events describes it. The 10-year-old Europa is, as you might expect, immaculate and with attractive public spaces. Restaurants boasts fine tableware, such as the specially designed Meissen porcelain in The Oriental, an Asian restaurant. Dining certainly is an affair to remember in any of the four restaurants on board. One of four ships in the Hapag-LLoyd fleet, Europa has established itself as a brand of its own. Emblazon a bag or a bathrobe with the Europa branding, and Germans will hand over an envelope full of Euros for the pleasure of owning a piece of Europa memorabilia. Of course, there are many repeaters on board, many of them happy to share their stories about how much they love this ship and the six eponymous vessels that preceded it. World’s best cruise ship? Certainly, in the minds of a few guide book writers and many devoted Germans. For me? I’ll let you know in a couple of days. For the time being, however, it’s time to get back and enjoy the cruise. Did someone say Wienerschnitzel? Auf Wiedersehen! Your North American readers may not appreciate the reverse of your quoted Twainism. Say G’day to Josef for me! Thanks for the note Tim. You’re absolutely correct. And I’m beginning to think you are correct also with your Six Plus Stars. Europa is certainly worthy, but so are a few others most likely . . . Readers should certainly see your review of Europa and other luxury vessels at Fielding’s Guide To Luxury Cruises.